Perfect as a starter or light meal, or why not make them smaller and serve as a canape or with a buffet? Step 1. Trim the smoked salmon and cut into 3 strips. Step 2. Crumble the Yorkshire Wensleydale cheese, finely chop white part of spring onions and mix a bowl. Step 3. Put mustard in to a separate bowl, add vinegar and mix well, add oil and season. Step 4. Put 1 tsp into Yorkshire Wensleydale mix. Stpe 5. 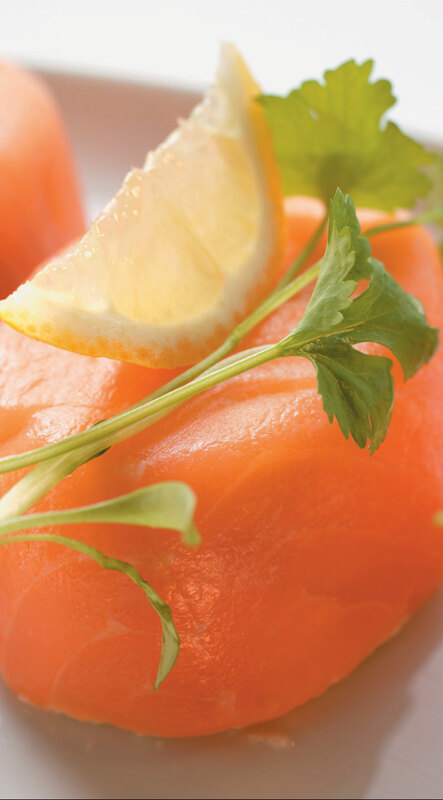 Put a little filling on smoked salmon and fold into a triangle, shape and then flatten to neaten. Step 6. Cut cucumber and apple into batons and put into a bowl. Step 7. Add mayonnaise, yogurt, horseradish and crushed walnuts and season. Step 8. Put salad on plate and lay 3 samosas on top of salad. Finely dice the radish and add to dressing with chopped parsley. Use chervil to garnish and serve.